When my C & G wine rep, Amanda, opens her bag of treats and out emerges a sample bottle of Christophe Mignon Champagne, I no longer need to wish for "a good day" as my rocket ship has just jet propulsioned me into hyper drive fueled on deliciousness. Now it is your turn, as Amanda will be taking control of the helm with a pouring of Christophe Mignon wines! Saturday, June 6th, 2014 1:00 p - 3:00 p. We'll have a $5.00 tasting fee that we will waive with the purchase of an Mignon wines and we are offering a 10% discount as well! To make everything even more exciting we'll have fresh oysters and truffle popcorn! About Mignon. 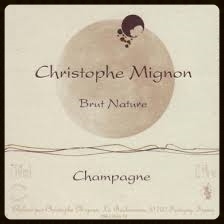 One of Christophe's mantras is, "the moon for a vigneron is like a metronome for a musician." and for the last 20 years he has been allowing the cycles of the moon to guide his activities on the vineyards his great grand father planted many moons before him. Incorporated in his practice are biodynamics, phytotherapy, homeopathy and geobiology. His vineyards cover about 15 acres in the Vallee de la Marne, an area particularly well-suited for Pinot Meunier, which he uses quite a bit of. In the cellar he relies heavily on indigenous yeasts with minimal amounts of sulphur. Amanda and I look forward to seeing you Saturday afternoon! The weather forecast s for heat, just perfect for fresh bubbles!